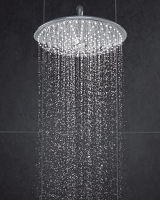 Equipped with the same GROHE technologies as GROHE Tempesta systems, GROHE Euphoria systems feature in addition luxury head showers from 210 mm to 310 mm in diameter. 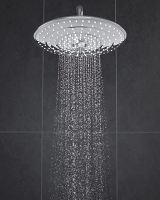 New Euphoria 260mm head shower features three spray zones to choose from. 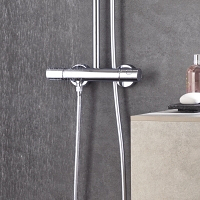 With just the turn of a knob you control the spray from a powerful Jet spray for rinsing out shampoo to a Rain spray that relaxes you after a long day at work. 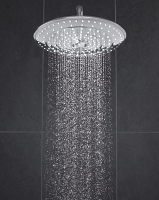 Other variants feature metal showers with GROHE PureRain Spray, the new and improved Rain Spray with even larger and softer droplets for a luxurious showering experience. DropStop function prevents after-dripping when closing the valve. 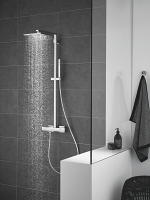 GROHE Euphoria shower systems are easily fixed to the wall and instantly add value to the bathroom both in functional and visual terms. 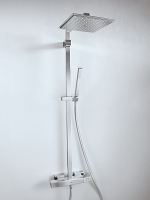 The shower rail features GROHE CoolTouch to prevent scalding and to protect the GROHE StarLight chrome surface. 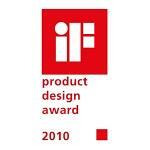 For a 100% Cubist bathroom go for GROHE Euphoria Cube shower systems with 100% Cube showers and shower system. 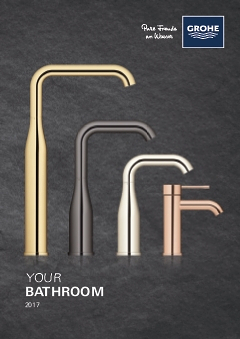 La perfecta combinación de formas cuadradas y rectangulares con las últimas tecnologías GROHE hace de Euphoria Cube la mejor opción si te gusta el diseño minimalista en el baño. 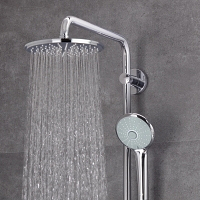 Sus líneas reducidas y su estética moderna resaltan las formas cuadradas de esta sobria colección, que introduce formas geométricas puras en la ducha. 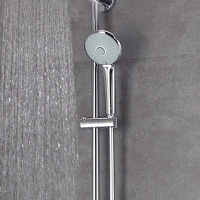 Para un chorro de agua perfecto Euphoria Cube incorpora la tecnología GROHE DreamSpray®.